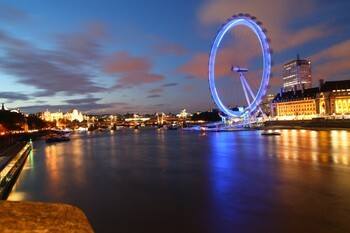 The plan to travel to London was more than year and half old, the main reason was to push my friend Andrew to go there, because it is the place that he had always wanted to see. But, when it should have happened, volcano on Iceland exploded (some people say that it was just Chuck Norris barbecue, but it is another story ) and we did not go anywhere. Since we were determined to visit it, we booked the tickets for middle August. First day was our travelling day. We were supposed to fly from Katowice to London-Stansted. Lukas was so kind and gave us a lift to the airport. Our experience with Polish roads was horrible, I do not understand, how people can drive there without SUVs . The flight was all right, considering we were flying in a „bus“ with RYANAIR. I fit there ok, I could even stretch my legs a little, but Andrew did not look to sit comfortably at all. From the Stansted airport we took the EasyBus service, which we had booked in advance. The bus dropped us next to the Sherlock Holmes museum. From there we decided to walk across the whole Hyde Park to the hostel. I must say, on the map it seemed shorter, the park is really huge. In the hostel we accommodated ourselves and since it was not so late, we went to the city to visit the Trafalgar and Picadilly Square, Big Ben, Houses of Parliament and Parliament Bridge. I took several night shots on that day, you can see them in the gallery. On the second day we got up early, ate the breakfast included in our accommodation – toasts and corn flakes and took underground to Tower of London, where we spent quite some time. The expositions were very interesting: the crown jewels, royal armoury and treasury, medieval palace and the famous ravens. Crossing the magnificent Tower Bridge lead us to our next stop – the HMS Belfast. It is a ship, former light cruiser, that is now permanently anchored on the river Thames and rebuilt into the museum. 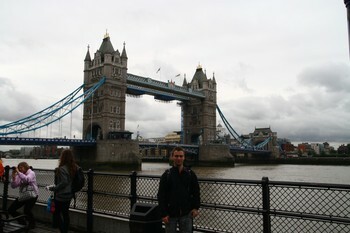 We took a walk on the riverside and then turned next to the London Bridge towards the Imperial War Museum. But before we had reached it, we found a nice tavern and had „flat“ beer. It was different, but drinkable. Andrew did not like it at all, so he got some Italian one to put away the bad taste. The Imperial War Museum is much bigger than we had expected, several floors filled with expositions and the lobby with air planes, tanks, rockets and various other vehicles. We hoped we could also visit the Churchill's War Rooms, but it was late and we would not make it. 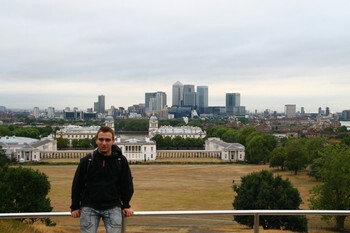 Instead of that, we took a train to Greenwich to see the Cutty Sark and the Royal Observatory. When we reached the Cutty Sark, most of it was not there . Posters said it is under conservation works and will be available in late 2011. However, the observatory was still standing and was open to public, so we can take the classic picture standing on the Prime Meridian. We came to the hostel very late and were so tired that we just dropped to bed. On our third day we planned to visit Wembley stadium. It is quite far from the city centre, but eventually we got there. To our disappointment we found out that there was a friendly match between England and Hungary and that there were no stadium tours taking place. That was a pity. Andrew wanted to see some English stadium, so we went to Arsenal. But there we found out that all tours are sold out . At least we got to Highbury stadium square, which is an old Arsenal stadium rebuilt into blocks of flats. Later we visited the Churchill's War Rooms and went to take lunch: grilled sausages with potato mash, onion chips and balsamic vinegar sauce. It looked very strange, but it actually was pretty tasty. The evening was reserved for shopping. We came in time of major sales (like 70% or so), so it was an opportunity to take advantage of them. Most of our shopping took place in the store on the Picadilly Circus. It had six or seven floors and together with crowds of people made us more tired than walking across London. The last day was, same as first one, the travelling one. We got up later, had the typical breakfast and took underground to monument, where I climbed up and down all the 311 stairs. Then we took sandwiches at EAT. They were tasty, lot of meat with slight taste of bread . Rest of the vacation was just travelling: going to the airport, waiting for plane, flying, waiting for Lukas at Katowice airport, drinking lots of Żywiec beer and going home. 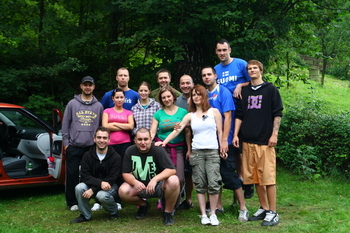 Last weekend me and my friends stayed in our cottage in the nearby village of Vrchy. The goal was simply to grill, drink beer and relax. Just an usual weekend and the cottage with the head switched off . Me and my friends at the cottage. I think we have fulfilled the goal completely: we consumed all 160 beers, ate almost everything we brought and definitely had fun. See for yourself in the gallery.